Thirty-nine years ago, the U.S. Supreme Court ruled, in Roe v. Wade, that the laws outlawing abortion in Texas were unconstitutional because a woman had a right to privacy, guaranteed by the Constitution. Suddenly, the unborn had no legal protection in the United States. But Roe v. Wade did not just deny legal protection to the unborn, it catapulted the United States toward all manner of unethical biotechnology. It is not just testes from aborted male babies that researchers want. Some want eggs from aborted female babies as well. The much-ignored reality of therapeutic cloning is this: to become a viable commercial therapy, an enormous amount of human eggs are required. So, researchers are looking to harvest eggs from aborted fetuses. So I asked, what do you grow these [embryonic]cell lines on now? On minced up human embryos, he replied. I cringed. “Isn’t there an ethical issue in that?” “You can take it from abortions. In the human you can use earlier embryos, from the first trimester,” he said. Companies Like ReNeuron, Neuralstem, Neocutis, and Senomyx are using tissue that came from aborted fetuses to develop drugs, treatments, flavor enhancers, and even beauty products. Some of the these companies do not publicly disclose where they got their tissue and so well-meaning pro-lifers and now faced with a world where the products they use were made possible by the deliberate killing of an innocent. A fact that thanks to Roe v Wade, companies feel they do not need to reveal. These mythical “reproductive rights” found somewhere in the Constitution mean that the United States has an out of control and unregulated fertility industry. If reproductive rights include terminating a pregnancy, then do they also apply to those who want to get pregnant by any means possible? There are many who believe so. Today anything goes because we somehow have a “right” to reproduce. Many other countries have laws regulating their fertility industries, limiting the number of embryos that can be created and/or transfered into a woman. Thanks to Roe vs. Wade, the United States has wild west human manufacturing that gives rise to Octomom and likely upwards of a million human embryos on ice waiting for a chance to finish their lives. Embryos stem cell researchers cannot wait to rip apart for the stem cell “gold” inside. If the primary moral objection to reproductive cloning is that it will likely result in genetic errors in reprogramming, then of course we want research to prevent that kind of problem. But how do we do that? 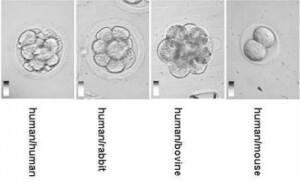 The best way is to see how cloned embryos develop and to study them, gestating them in female chimpanzees, artificial wombs, or human volunteers, then aborting them to see which are normal and which are not, then experimenting to see how to create only normally developing embryos/fetuses. There are technology junkies that want to take these mythical “reproductive rights” even further and call them “somatic rights.” They believe these “somatic rights” give them the power to modify their bodies with any kind of enhancement that they want. These are transhumanists. They are not happy to be simply human, they want to be “posthuman” or “superhuman” using technology like genetic engineering, cognitive enhancing drugs, artificial limbs and intelligence to go beyond healing, transforming humanity into something else entirely. They want to be able to chop off perfectly good limbs and replace them with artificial ones. They want to genetically engineer themselves and their offspring to be superior than the average human. Transhumanism would necessarily create a two-tiered society where those that can afford or have access to enhancements would rule over those that can’t or don’t. Actions such as abortion, assisted suicide, voluntary amputation, gender reassignment, surrogate pregnancy, body modification, legal unions among adults of any number, and consenting sexual practices would be protected under law…. Transhumanism cannot happen without a legal structure that allows individuals to control their own bodies. When bodily freedom is as protected and sanctified as free speech, transhumanism will be free to develop. 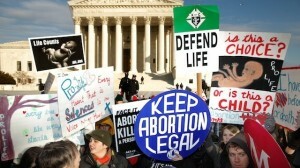 Roe v. Wade did more than just legalize abortion across the Unites States. By denying the human embryo any rights, it has enabled the current practices of embryonic stem cell research and therapeutic cloning. These, in turn, are just stops on the way to reproductive cloning. With legalized killing of human embryos in the womb, we have no moral grounds upon which to object to killing them in a test tube; no way to object to the use of aborted fetal tissue in research and manufacturing. Without Roe v. Wade would there be no fictitious “reproductive right” that seems to trump all others in our society. “Reproductive rights” have become “somatic rights” that will be used to justify invasive enhancements of healthy men, women and children in the future. Roe v. Wade has a legacy far beyond abortion. We will feel its reverberations for generations and beyond.